Frederick Coburn (1871-1960) was arguably Canada’s best-known painter at the peak of his career. Nick Fonda revisits Coburn’s work providing charming new insight into the painter and his surroundings. His method includes casting an inquisitive gaze on other accomplished artists who have followed quite unusual paths as they responded to the same muse that moved Coburn a century ago, the Eastern Townships. These include Minnie Gill, Denis Palmer, Mary Martin, Stuart Main, France Jodoin, and Keven Sonmor. 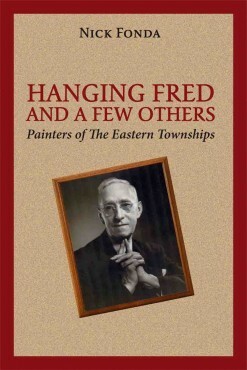 Based on interviews with neighbours and Coburn aficionados and Nick Fonda’s own thorough understanding of the milieu in which Coburn grew up, lived, and worked, Hanging Fred and a Few Others is more than a biography of an important artist. It is also a lively and fascinating reflection on the role of place—the Eastern Townships—in an artist’s life. F.S. Coburn, in addition to being a painter, was an accomplished photographer. Nick Fonda, with the help of Bob Laberge, also presents 14 photos from the family collection, all taken or inspired by Frederick Coburn. “In his lively, fluid style, Nick Fonda brings to life the character and work of well-known Canadian painter Frederick Simpson Coburn. Woven into the narrative are also portraits of several other Townships artists and the impact the region has on their work. … fun and fascinating, the book is an important addition to Townships lore.” Barbara Verity, writer and former editor of The Record. Nick Fonda is a teacher, journalist, and writer. He has contributed to various newspapers and reviews, including The Montreal Gazette and The Sherbrooke Record, and is the author of Principals and Other Schoolyard Bullies, a collection of short stories, and Roads to Richmond, Portraits of Quebec’s Eastern Townships, both published by Baraka Books. Nick lives in Richmond, Québec.